Governor Brown has signed A.B. 8, my bill to enable law enforcement to engage the public to catch Hit-and-Run perpetrators, by using our state’s existing network of Changeable Network Signs (lighted signs on freeways). A similar bill was vetoed just last year, but your persistence paid off! Thank you to all of you for supporting this very common-sense piece of legislation. Hit-and-run victim Damian Kevitt addresses this morning’s A.B. rally at Los Angeles City Hall. Photo: Joe Linton/Streetsblog L.A. Earlier today, on the steps of Los Angeles City Hall, Assemblymember Mike Gatto hosted a rally to call for California Governor Jerry Brown to approve the bill. 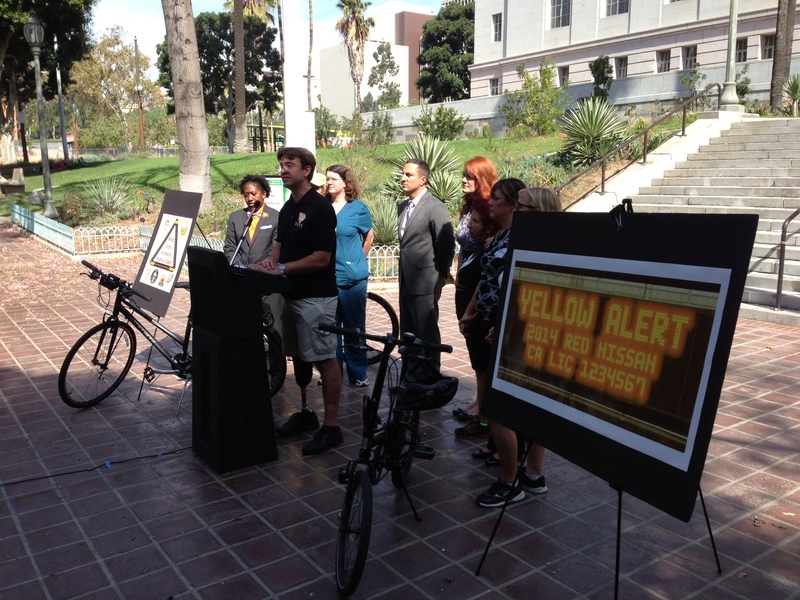 Gatto was joined by active transportation and health advocates, and by hit-and-run victims and their families. Last year Brown vetoed a similar bill, A.B. 47, citing concerns over overburdening the state’s system with too many types of alerts. Over the summer, Gatto modified A.B. 8 to address concerns raised by the CHP. Damian is an incredible man who has rallied countless Californians, and one bold young Assemblymember, into making a material difference in the lives of people riding and walking in this state! Awesome news! Thanks Damian! Thanks Mike Gatto! Your work gives me hope that our system is worth working with; that we don’t have to throw everything away and start all over again – we can fix things and work with the powerful to make life better.